M.L.E. Vigée Le Brun, Souvenirs de Madame Louise-Elisabeth Vigée le Brun, Paris, 1835/37, II, p. 211, note 1. H. Douwes Dekker, Catalogue des Portraits en Huile et en Pastel Retrouves, 1978 (unpublished doctoral dissertation), no. 157, illustrated. H. Douwes Dekker, De Zelfportretten van Elisabeth Vigée-Lebrun, Tableau, Feb. 1988, p. 65, no. 15, illustrated p. 64, pl. 15, as datable to circa 1808. Madame Vigée Le Brun made her first visit to Switzerland in 1807 and spent two weeks at Coppet with the celebrated novelist, Madame de Stael. The following summer she returned to Switzerland, determined to explore it more thoroughly. She travelled to Untersee in order to attend the Festival of Shepherds, held only once a century, almost a pagan event marked by fireworks, wrestling matches, rock throwing, and midnight chanting. 'I knew that M. Konig had prepared rooms for me, and made my way to his house', she recounted. 'M. Konig held open house for all of the distinguished visitors who had come to see the Shepherd's Festival. Before going any further, I must tell you that M. and Mme. Konig would not accept a penny during the whole fortnight I spent with them; 'We were so happy to have you as our guest!' they said to me. 'We can never repay you for the honor.'' The Konigs would be more than repaid, however: 'The only payment that I was able to make M. and Mme. Konig for their hospitality', the artist later mentioned in a footnote to her Memoirs, 'was a self portrait in oil that I sent them from Paris'. The present self portrait, made for her hosts, is one of the 'four self portraits for my friends' painted 'following my return to Paris' --it is mentioned by Vigée Le Brun in the lists of her works that she compiled. 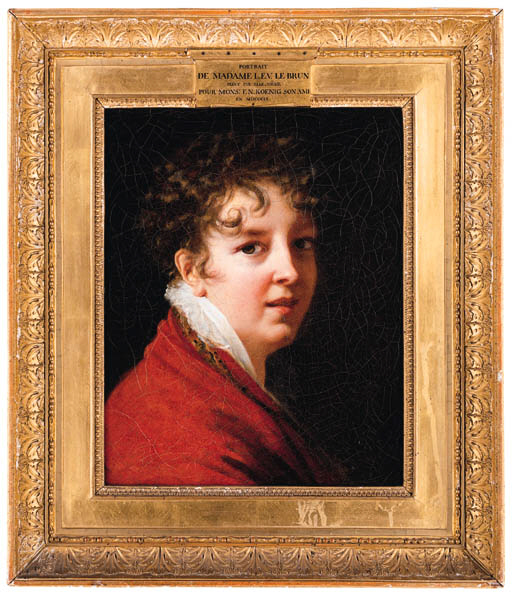 The painting is still in its original frame, which is inscribed on a plaquette at the top: 'Portrait de Madame L.E.V. Le Brun Peint par Elle-Memme Pour Mons.r F.N. Koenig son Ami en MDCCCIX' (the artist herself later recalled, inaccurately, that her second trip to Switzerland had occurred in 1809, whereas she had stayed in Untersee in 1808). Madame Vigée Le Brun seems to have felt a genuine affinty for Konig, who was himself a painter. '[He] used to sketch landscapes,' she observed. 'I often strolled about the countryside near Untersee with M. Konig, who was very talented and worked with great facility'. She remembered in her old age that Konig later 'came to Paris to see me and brought some of his paintings en transparent for me to look at; I kept them in my house and everyone was delighted with them'. The portrait of herself that she gave Konig as a keepsake is one of her most informal, and reveals something of the affection that she felt for the recipient. Painted when Vigée Le Brun was 53 years of age, it shows a face no longer young, but still beautiful, and filled with vitality, good humor, and keen intelligence -- qualities that were widely admired in both the artist and her works. (All quotations in English translation from The Memoirs of Elisabeth Vigée-Le Brun by Sian Evans, 1989). The present painting will be included in the catalogue raisonné of Vigée Le Brun's paintings that is being prepared by Joseph Baillio.